Here's our Kubota L4400 tractor review! Although it's definitely not necessary to have a tractor to harvest firewood, I've found a 4x4 tractor with a front loader makes the process a lot easier. 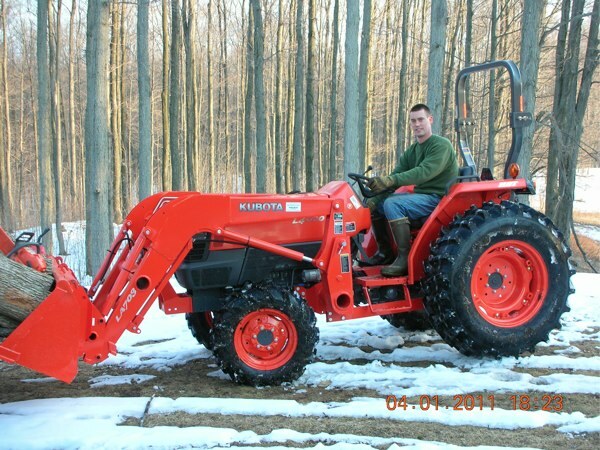 About 10 years ago I purchased my first tractor, a 4x4 Kubota L275 with a front loader. The tractor was built in the early 80's but it was still a nice little tractor. The 27 horse tractor could do a lot of work. I used it to plow snow, drag trees and carry firewood. Overall I was really happy with what the L275 could do. The one thing I didn't like about the L275 was it's stability. The narrow wheel base made the tractor feel very tippy. I can think of a few occasions where I had to dump the load in the bucket to keep the tractor from rolling over. As long as you were on level ground it was fine. As the family grew we decided it was time for a bigger, newer, more stable tractor. I'm a Kubota fan. The tractors are well built and affordable compared to other similar brands. We started off by shopping for a used tractor but quickly realized used Kubota tractors really hold their value. After a lot of research and shopping we found Kubota was offering some great deals on new tractors. We decided to purchase a new Kubota L4400. I've had the tractor for 1 year now. So what's my opinion for this Kubota L4400 tractor review? I Love It! Before I bought the tractor I knew it needed to have a few things like four wheel drive and a front loader. My biggest decisions were tire style and whether or not to get hydrostatic transmission. I opted for the agricultural tires for improved traction and paid the extra $1000 for the hydrostatic option. I had no idea I would like the hydrostatic so much. Other than being a little loud and loosing a little horsepower, the hydrostatic transmission allows you to quickly switch from forward to reverse and makes front loader work a breeze. Compared to my L275, the L4400 feels like a tank. Its larger wheel base and extra weight makes the tractor real stable and it has exceptional power. It came equipped with the LA703 loader. For general chores around the house, snowplowing and firewood, this loader does anything I need. It's a quick attach loader and bucket so any quick attach implement will fit. I also paid a few extra dollars and upgraded to the heavy duty bucket. I had the dealer weld three hooks on top of the bucket. You loose a little capacity with the heavy duty bucket, but it has a reinforced top which reduces the odds of the bucket bending under pressure. I added this Kubota L4400 tractor review because we use this piece of equipment nearly every day. From dragging trees out of the woods to filling up the bucket with freshly cut logs, a tractor can make the job a lot easier.